DIY! Turn a pallet into a garden. The possibilities are endless; color, vegetables, herbs or both! Why not plant upright for small spaces or to jazz up an area of your yard or patio. 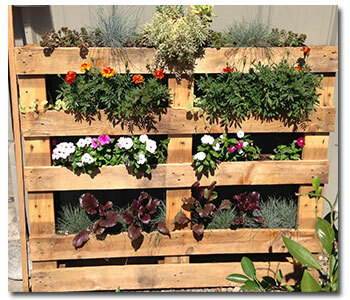 Pallet gardening is easy and can be a fun project for the kids. One of the biggest problems vertical gardening addresses is how to create more gardening space in our ever-shrinking gardens. For this problem, vertical gardening is a great option. Vertical gardening can be used to disguise unattractive parts of the landscape, provide the means of creating and defining garden “rooms” or to add a striking focal point to a garden. Vertical gardening can be done with ornamentals as well as fruits and vegetables. Given the correct structure, it can be done with almost any perennial, annual, vine or ground-cover, even succulents. It can be used to create a solid wall of flower color or a beautiful mosaic-like pattern, using plants with different foliage colors and textures. For baby-boomers (and beyond) out there, it can save wear and tear on knees, backs, etc. because the plants are at eye level and therefore easier to tend. Growing vertically also creates a whole new dimension in which to enjoy the plants’ attributes: beautiful foliage, colorful flowers, fragrance, etc. You can purchase a ready-made structure for your vertical garden, but you can also easily make a low-cost one yourself. Good-quality potting soil. Roughly two large bags. For the main structure, you will be using the pallet. These can sometimes be found in or near dumpsters behind grocery stores or warehouse-type stores or at garden centers. Be sure to choose a pallet that is in good condition, with no split or rotted wood. Once you get it home, if it does need a little TLC, you should be able to easily provide it by nailing any loose boards and sanding any particularly rough spots. Give your pallet a final look and choose the best-looking side for the front. If you intend to put edibles in your pallet, be sure to find one that was heat treated as opposed to fumigated with pesticides. 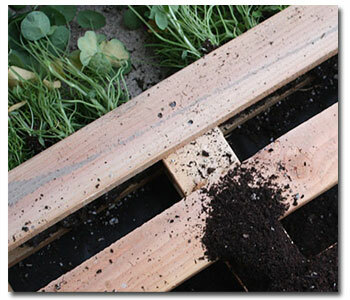 As mentioned above, gather your supplies and prepare them ahead of time so you can dive into your pallet garden project without having to stop and run to the hardware store or garden center again. For this project, you’ll need the pallet you found, 2 large bags of potting soil, 16 six packs of annual flowers (one six pack per opening on the face of the pallet, and two six packs per opening on the top of the completed pallet garden), a small roll of landscape fabric, a staple gun, staples, and sand paper. Decide which side of the pallet will be the bottom when the pallet garden is completed and leaning against the wall. 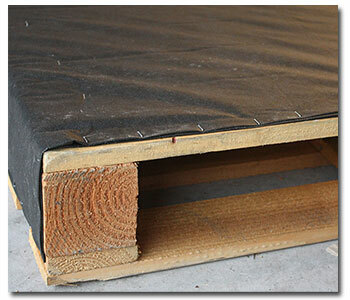 Lay the pallet face-down and roll the landscape fabric over the back. Cut two identically sized pieces that are long enough to go from the top edge of the back of the pallet and wrap all the way around the bottom, plus a few extra inches. 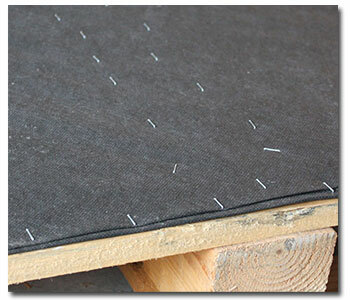 Holding the two pieces of fabric together and starting at the top, turn the edges under an inch and begin stapling the fabric (at 2″ intervals) all along the top board. The pallet should be centered on the fabric so that there is enough fabric to wrap around the sides and bottom, eventually covering all these surfaces. At the bottom corners, pretend you are wrapping a present and fold the corners to make them smooth and neat, then continue along the sides. Stretch the fabric a little as you go to make sure it is taut while continuing to staple the top, right edge. You do not want it to give way once it is planted so add a staple every two inches. At the end of this part, you will have created a container–it is open on the top and in the front between the boards (the boards should be running horizontally), but all other sides are securely covered with landscape fabric. Now lay the pallet face-up near its eventual home (it will probably be fairly heavy, once it is completed). Make sure all the plants are moist. Remove them from their containers and position them, closely spaced, along the top of your pallet. Place them so that they are slightly down from the top board, so that there will be room for watering. Now, starting at the bottom, push potting soil into the area between the last opening and the landscape fabric on the bottom; then plant the space above it. Continue on in this manner until you reach the top. When using the potting soil, make sure that it is pressed in tightly; if it is too loose, you will be unable to water effectively and everything will be unstable and “shrink.” Your plants should be packed in as tightly as possible. Although, all the plants don’t need to be “trailers,” some trailing plants are desirable–these will help cover the front boards of the pallet. We hope you’ll consider giving vertical gardening a try. There are so many possibilities to create just the right ambiance for your garden. Have fun with it and make it your own. If you are doing this with the kids, they will love making their very own pallet garden!